Another great cricket bio for you this week – this one from Andrew “Freddie” Flintoff. “Second Innings” covers not only his cricket career, but as the title suggests, his life after retiring from cricket in 2009. He tells his story with plenty of “northern” humour. In fact, if you read the book with a Lancashire accent, it really is quite funny in parts! Freddie was born in Preston, Lancashire and brought up in a fairly rough part of town where playing cricket had about as much street cred as dressing in drag. He also admits to playing chess so you can imagine just surviving to the end of each school day was a major achievement! He says upfront that two people have been jostling for control of his life. 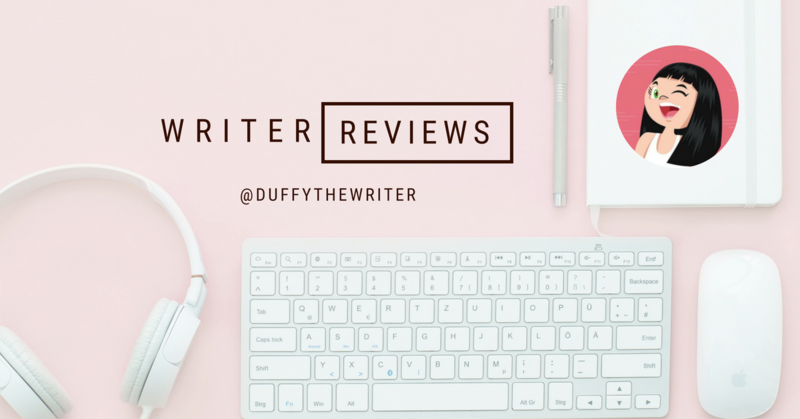 Andrew is insecure, introverted, self-conscious and ……. boring. Freddie is full of bravado, ultra-competitive, up for anything and always has time for a “pint and a fag” with the lads. Thank goodness the book is more about Freddie than Andrew! Here are just some of the things Freddie gets up to: hosting his own meeting in the Cabinet Room at No. 10 Downing Street after that infamous champagne fuelled open top bus ride with the England team to celebrate their 2005 Ashes triumph http://www.gettyimages.com/detail/news-photo/london-united-kingdom-englands-cricket-team-rides-in-an-news-photo/55392328 trying to get on a pedalo on a St Lucia beach during the 2007 World Cup in the West Indies whilst completely off his face http://www.independent.co.uk/sport/cricket/andrew-flintoff-pedalo-former-england-captain-reveals-infamous-drunken-pedalo-incident-was-an-9728190.html ; as England captain, singing Johnny Cash’s “Ring of Fire” as his team talk during a lunch break in the Third Test against India in 2006 (which they went on to win); and kicking off his TV career post retirement with a show called: Flintoff versus the World………Flintoff says he is going to tell his children to ignore the first few pages of any Google search they might do on him one day. He calls the 2005 Ashes series “the greatest”. For England fans, in the last 40 years, it probably was. Australia still had a fantastic team and was meant to win. They easily won the First Test at Lords and it looked like the writing was on the wall. But England went on to win two very close games at Edgbaston and Trent Bridge for an unlikely 2:1 series win. English pride swelled and Ashes cricket once again became the pinnacle of the sport. 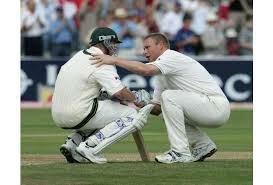 But for me, it was the image below of Flintoff (Andrew or Freddie) with his hand on Brett Lee’s shoulder at the end of the Edgbaston Test which sticks in my memory. Australia still needed about 80 runs to win when the Number 11, Michael Kasprowicz came out to bat. To everyone’s amazement, he and Lee got to within 2 runs before Kasper was agonisingly (if you are an Aussie supporter) given out (controversially mind you) caught behind down the leg side. The English team went crazy and the two Aussie batsmen were absolutely gutted, but Flintoff (who was voted Man of the Match), calm as you like, walks over to Lee and seems to show genuine concern for how Lee is feeling. Aussie cricket fans flashed back to the famous Allan Border/Jeff Thomson partnership at the MCG in the 1982-83 Ashes series when the Aussies again just fell short. Have a look at how crazy the poms go here: https://www.youtube.com/watch?v=Sn9cDngTmMs . So do you see anyone rushing over to embrace Thommo? No doubt Thommo would be a scarier proposition to hug than Lee. You wouldn’t catch Thommo in a Bollywood movie! But the point is that after a hard fought Test which England really had to win; where Flintoff had every reason to be ecstatic about his own performance and that of his team; and where the sheer relief at winning such a close game must have been palpable, here is an international cricketer seemingly showing genuine empathy for the disappointment felt by England’s oldest enemy. 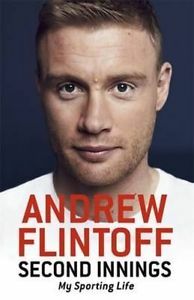 Flintoff in his book plays the incident down. He reckons he wouldn’t have said any more than: “Unlucky Brett, see you next week”. Your words don’t match the photo Freddie (or Andrew). Don’t try to back out now! You big softy! They used to call another great English all rounder “Golden Balls” because some thought he had more than his share of luck. There is no doubt an element of good fortune in Flintoff’s journey as well. He has a family who seemingly support every crazy thing he does. He has got some good breaks in TV in England and Australia and even won the first Aussie series of I’m a Celebrity…….Get Me Out of Here. He had a crack at boxing and won his only professional bout (this chapter is pretty funny). He made a comeback for Lancashire in the 2014 T20 final and almost won it for them with very little preparation. But he has also had big struggles with alcohol (if you want to know how to make something called a Grenade, turn to page 136) and injury during his career and had to deal with some demoralising performances by England – particularly the 5:0 series whitewash by Australia in 2006-07 when he was captain. He admits he thought about bailing out of that series. Flintoff has however made his own luck and you can’t take that away from him. He says: “We have a rule in our household: you commit to things 100 per cent, have a proper go, or you don’t get involved.” In another chapter he says: “It might look as though my career after cricket – one minute a professional boxer, the next presenting on TV and doing theatre gigs – has taken one surprising turn after another. And its true that I am always tackling new things. But there is also a common thread: the need to perform, to find new challenges, to push myself and find my limits. I’ve always had a desire – perhaps “need” is a better term than “desire” – to throw myself in at the deep end.” He did the hard yards needed to play 79 Tests, score 3845 runs at an average of 31.77 and take 226 wickets at 32.78 which puts him amongst cricket’s best all rounders. Now he is clearly throwing his big heart into his “second innings”. Good luck to him! Looking forward to more reviews from Mr B in 2016! « Customer Experience Is the Brand – Brands have nowhere to hide..